Onstage This Week: Program of Premieres at BalletX, Denver-Based Companies Join Forces, Pennsylvania Ballet's New "Giselle," and More! Houston Ballet's Karina González and Chun Wai Chan in rehearsal for Jerome Robbins' The Cage. Lawrence Knox, Courtesy Houston Ballet. Pennsylvania Ballet Presents the World Premiere of Angel Corella's "Giselle"
Sarasota Ballet Revives Ashton's "Apparitions"
San Francisco Ballet and Alabama Ballet Present "The Sleeping Beauty"
Missed World Ballet Day? Here's Your Chance to Catch Up! Members of San Francisco Ballet in company class as part of World Ballet Day LIVE 2017. Photo by Erik Tomasson via San Francisco Ballet on Instagram. Last Thursday was World Ballet Day LIVE, the official 22-hour live-stream relay showcasing companies across the globe. If you were busy (we know that you don't always have the luxury to spend an entire day watching ballet), don't fret. Many of the companies involved recorded their classes, rehearsals and interviews from the day of, and we rounded them up for you to watch at your leisure. Careful, though; there are more than twenty hours of footage included here... make sure you take a break to, you know, sleep. First up is San Francisco Ballet with a full five hours, including rehearsal for Balanchine's timeless classic, Serenade. The Royal Ballet's WBD stream is split into three parts. Here's the first chunk, featuring company rehearsals of a few Sir Kenneth MacMillan ballets as well as Christopher Wheeldon's Alice in Wonderland (a measly two hours and 45 minutes). You can find part 2 here and the full company class here. The video also features a quick aerial tour of London from the balcony of the Royal Opera House. When it comes down to it, there are two basic types of performers who make great dancers: Those who demand attention onstage, and those who inconspicuously draw it in without outwardly trying. In many ways, it's much simpler to be that first type of dancer. You just have to hit it, hit it hard and give the steps everything you've got all the time. Not to say that's an easy thing to do, but audience members can't help but notice the "wow" factor of extreme technique or a fierce stage presence. This performance quality often comes in handy, winning dancers medals at competitions and helping them stand out from the crowd at cattle calls. But personally, I always prefer to watch more subtle performers. I found one of them Saturday night when I saw The Washington Ballet perform a triple bill of bare-legged leotard ballets by Edwaard Liang, Karole Armitage and Nicolo Fonte. Morgann Frederick shone through the corps of each of the three pieces with an understated, but committed focus. In each piece, she was never the first dancer my eye was drawn to (save for when she was showing off those runway-diva struts in Fonte's Bolero). But once I spotted her, she was captivating. Every move she made—whether it was a big developpé a la seconde or a simple turn of her head—had an intention behind it. Her eyes, her face, her very being seemed to be fully "in the present," focused on each step of the choreography. It was very internal. Yet despite eye-popping tricks or look-at-me projection, it was exhilirating. She seemed to be dancing for her, not anyone else—and throroughly enjoying it. Melissa Barak: From New York to L.A. Choreographer Melissa Barak, who launched her dance career with New York City Ballet and then Los Angeles Ballet, fittingly draws much of her inspiration from her dancers. While still performing, she became the youngest choreographer to create a work for NYCB. But in 2013, she launched her own company, Barak Ballet, in L.A. This Friday and Saturday, Feb. 6-7, her troupe presents a triple bill at Santa Monica's Broad Stage. 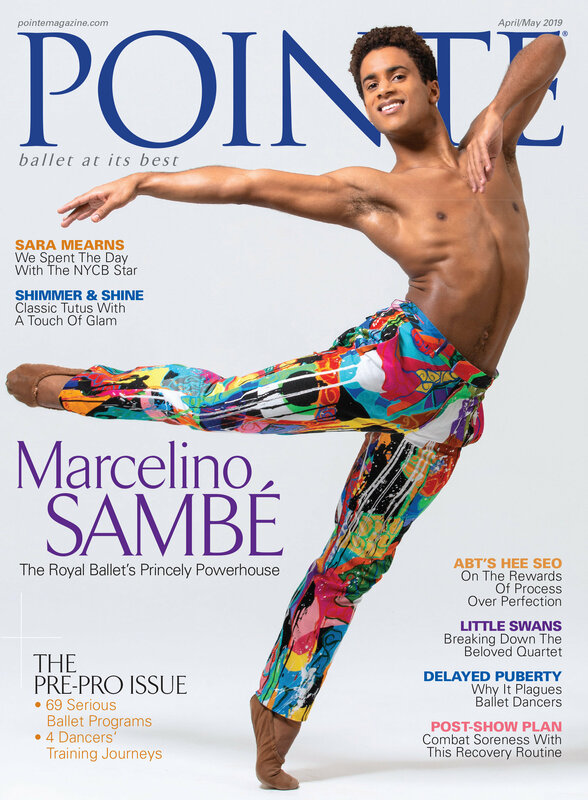 Pointe spoke with Barak for its bi-weekly newsletter before opening night. What can we expect on the program? Each ballet is very different musically and stylistically. I initially made Yueh Fei at the National Choreographers Initiative in Irvine in 2007, but I've reworked the pas de deux and added an extra movement, a men's dance. Next is Nicolo Fonte's Left Unsaid, which is a stunning work set to Bach. And last is a piece I made on Sacramento Ballet called Middle of Somewhere. It's straight up neoclassical dancing.